In what was described as a move to "leverage our global eCommerce strategy," the Swiss-German logistics provider Kuehne + Nagel has acquired the operations of Indonesian company Wira Logistics. In a statement, the company said the acquisition will strengthen its nationwide warehousing and distribution network in Indonesia. “Indonesia is arguably the most important internet market in Southeast Asia in terms of its sheer size, emerging middle class and digitally savvy population. With this acquisition we can leverage our global e-commerce strategy,” said Gianfranco Sgro, a member of the managing board of Kuehne + Nagel International AG and responsible for contract logistics. The acquisition will also strengthen the company's contract logistics footprint in Asia, Sgro added. The statement further reads that the expansion of it’s warehousing and distribution capabilities in Indonesia where imports and exports account for close to US$300 billion annually has been a strategic focus for the company. In a separate move, Kuehne + Nagel also recently opened offices in Baku, Azerbaijan and Almaty, Kazakhstan to meet the growing demand for logistics services primarily in the oil and gas industry. The company said both countries are experiencing annual GDP growth rates of around 4%. 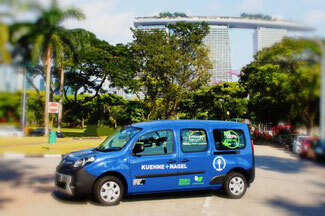 Meanwhile, alternative fuels are also making their way into the logistics sector with Kuehne + Nagel last month rolling out a fleet of electric vehicles (EVs) in Singapore which the company said will "provide customers with environmentally friendly transportation option that reduces the carbon footprint."